I’ve had the worst mac and cheese craving for WEEKS. I don’t know how, because every food that exists has been readily available for the last month, but I still wanted some mac and cheese. Not Kraft Dinner either, although I’m definitely not above eating good old KD every now and then. I wanted a super creamy from scratch version. And with shells, because I love them. I got my chance to whip it up when I heard my brother-in-law was smoking pulled pork for New Year’s Eve. My Main Taste Tester asked if we could bring fancy mac and cheese as our contribution to the meal and I had to agree that mac and cheese and pulled pork are kind of a match made in heaven. I wanted this dish to be similar to that of our favorite local BBQ joint. They have a not too thin, not too thick bright cheddar sauce with a little bit of heat and a garnish of extra shredded cheese and green onion. 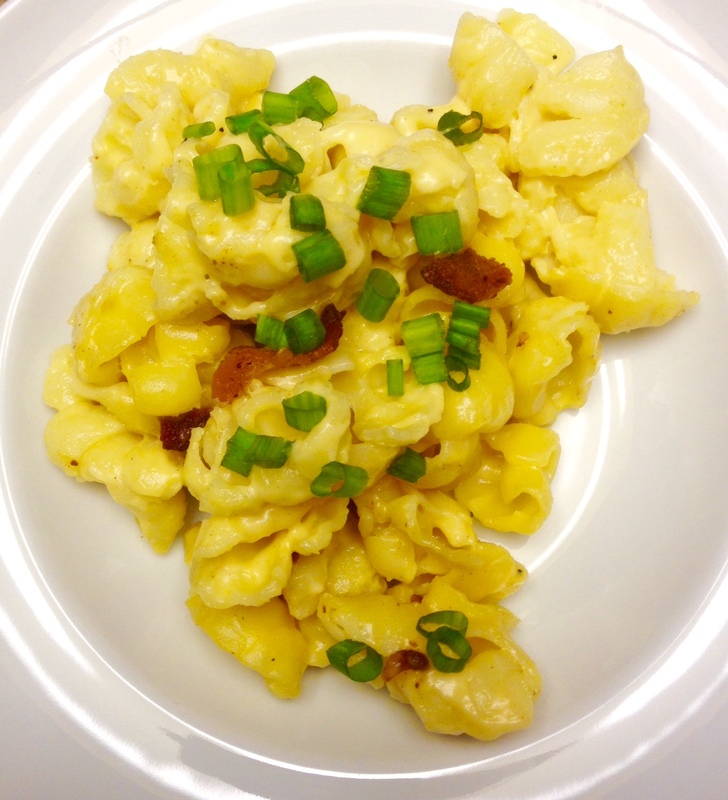 We love that mac and cheese and I felt that this came pretty darn close! It hit the spot. The only thing that could be better? I added bacon on top. You need it! Put a large pot of salted water on to boil. Once boiling, add your pasta shells and cook to al dente, then drain. While the pasta cooks, fry your bacon over medium heat until crisp. Once cooked, set it aside to cool and reserve 1 tbsp. of the bacon grease. In a large saucepan, melt together the reserved bacon grease and the butter. Once melted, add the flour and cook for a few minutes over medium heat until the mixture darkens to a golden color. Add the milk, stirring constantly until the mixture begins to thicken. Stir in the cheese and spices and mix until totally melted and smooth. Add salt to taste. At this point, you can add a little more milk to thin your sauce if desired. Stir the sauce into the cooked pasta. Chop your cooled bacon. 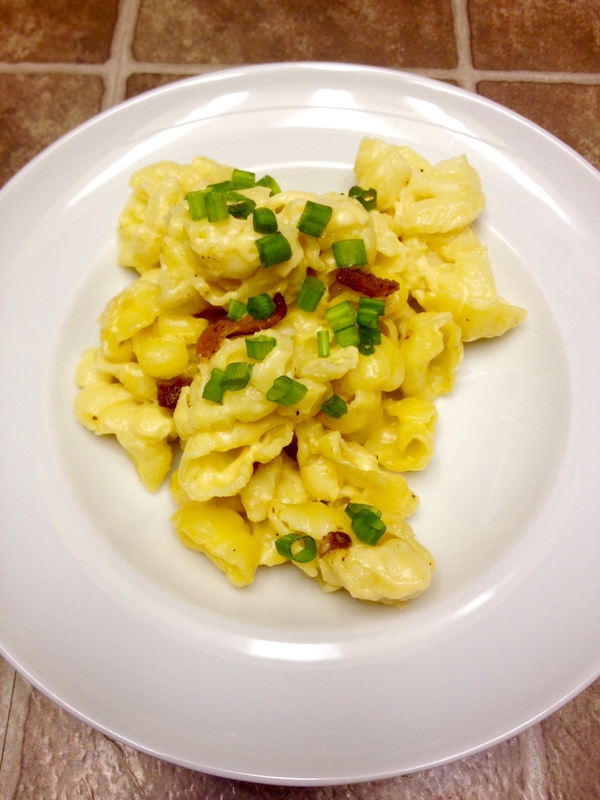 Garnish each serving with chopped bacon, extra shredded cheddar and diced green onion. Note: I chose not to list a specific salt quantity in the recipe because the amount of salt in the bacon and cheese can differ so much. I used about ½ tsp in mine but use what tastes good to you!